Have you ever sat in your car and thought, ooh, it’s a bit cramped in here? If you have then spare a thought for anyone who has ever driven the Peel P50. You can’t go and drive onto the local football pitch for a kickabout in your normal car, can you? Actually, you probably could but it would be weird. The good thing about driving such a small car is that you look weird no matter what you do anyway. I reckon you could get a giant inflatable ball and play some sort of carball game with it. 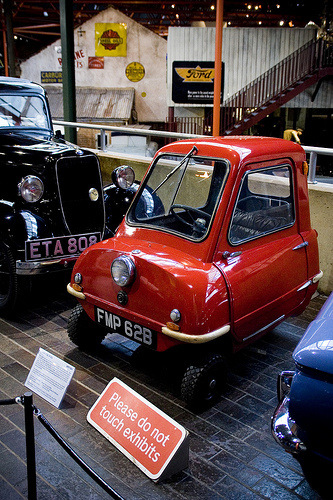 The only problem is that the original Peel P50 doesn’t have a reverse gear, so you would need to get out and pull it backwards when it is time to retreat. Part of the Top Gear show about the P50 showed how Clarkson went into the lift in his car. This is a great idea but you could take it even further and make your car your desk. This means that you could spend all day in your car. When you wanted a drink you could drive to the drinks machine and when you needed to go to the toilet, well, that could get a bit messy if we are being honest. Do you know those days when you just can’t be bothered driving home? Yeah, well now you don’t have to. Just flag down the bus, lift up your P50 and hop on. You can then sit in it if there are no spare seats and you won’t need to worry about the walk home at the end of the bus journey either. 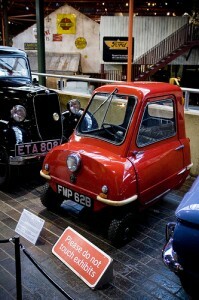 This entry was posted in Humour, Musings, News and Views, Small Car by Robert Bell. Bookmark the permalink.